The Scene opens and discovers a Prison, where Pollidor and Phillora appear next the Stage chained to a Ring fastned to the ground [;] upon the other side of the Prison, and in a darker part of the Scene lies Palantus chained behinde them in the dark, Bellamira chained, and afar off in prospective other Prisoners and dead Carcases. The Scene is Chang’d./ Being wholly fill’d with ROXOLANA’S Rich Pavilion, wherein is discern’d at distance, IANTHE sleeping on a Couch; ROXOLANA at one End of it, and HALY at the other; Guards of Eunuchs are Discover’d at the wings of the Pavilion; ROXOLANA having a Turkish Embroidered Handkerchief in her left hand, and a naked Ponyard in her right. Taken in relation to the earlier play, which makes no reference to doors in the stage directions, and which was staged throughout with fixed wings, the first of these directions may imply forestage doors, and “wholly fill’d” in the second hints at the use of changeable wings. As Ann-Mari Hedbäck suggests, the two references to doors in part two may indicate that the printer’s copy was a manuscript connected with a pre-Restoration performance (albeit one for which no record exists). However, they may also suggest that by 1659, or thereabouts, Davenant had already decided on the form of his future scenic stage (if he had not done so already for his aborted Fleet Street theatre of 1639). If we accept that the second suggestion is plausible, these two directions may be seen as indicating the nature of the future LIF stage: a forestage with doors of entrance, fully changeable scenery, and a separate discovery or relieve space (Ianthe “discern’d at a distance”). The contrast between the depths of Killigrew’s imagined discovery space and Davenant’s carefully delimited area – one actor on a couch and one at either end – suggests another index we may use to check the universality of the proposed LIF model. An exact measurement of the LIF relieve/discovery space is of course impossible, but figures for other stages may be used as a guide. 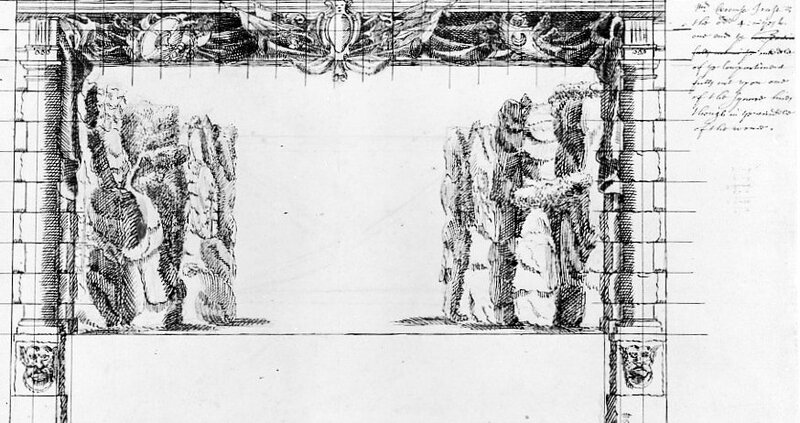 To add to the figures noted above for the Hall stage and Barlow’s model, the relieve area on the larger Salmacida Spolia stage, for example, had a total depth of 8 feet 7 inches (in each case the relieve area is approximately one third the depth of the whole scenic stage). Sightlines obviously determine the extent to which an audience member would be able to see into such a relieve area. At best, the view is a rectangle bounded by the rearmost wing edges and the background scenic element; at worst, in a side seat, one of the corners would be lopped off. For the purposes of this study I assume the optimal viewpoint. It is helpful at this point to recall the two other indices of universality for my LIF model: no more than two forestage doors in any one scene may be indicated as practical, and discovery/relieve scenes cannot occur successively; also to restate the main scenic specification, the model allows the loading of three wing settings and four backscenes (three backshutter pairs and one relieve), but additional settings may be accommodated by replacement (removal) during act breaks. Should more than three wing settings or four different backscenes be required mid-act, settings may be replaced at scene changes, but there are obvious practical limitations involved should multiple changes be demanded. The evidence from Restoration promptbooks is that while scene keepers may have simplified an author’s demands depending on their scene stock, it was standard practice to match as far as possible appropriate scenery to locations stated or implied in the play text. Alfred Harbage suggests part two may have been premiered during the Commonwealth, but the only evidence to support this is the entry in the Stationer’s Register for 1659 (see Cavalier Drama, New York: Russell & Russell, 1964 , p.212). If it did receive a Commonwealth performance the two female roles may have presented a problem for there were few, if any, trained boy actors at the time, as the prologue to the King’s Company production of Othello (Vere St., 1660) testifies: “For (to speak truth) men act, that are between/ Forty and fifty, Wenches of fifteen” (Pierre Danchin, The prologues and epilogues of the Restoration 1660-1700, Nancy: Publications Université de Nancy, 1981-88, part 1, vol.1, p.56). Comedies and Tragedies, London: Henry Herringman, 1663, p.542. Act 2.1 of Killigrew’s Thomaso (p.326) calls for the backshutters to open and discover a piazza and several practical balconies. The Hall figure is stated on Webb’s plan (see Orrell, The Theatres of Inigo Jones and John Webb, p.174). Barlow places his backcloth approximately 10 feet 3 inches from the rear wall of the theatre, the relieve depth stated above is therefore the gap between the shutter frame and the backcloth. Barlow does not provide a specific reason for placing the backcloth where he does, but the relieve depth is in proportion both to this stage and to the other stages discussed here (see ‘From tennis court to opera house’, unpublished PhD thesis, University of Glasgow, 1983, vol. 3, fig. 16). London: Harrap, 1966 (5th ed. ), p.169. Killigrew had a semi-official position in Venice as Charles Stuart’s Resident, but as Alfred Harbage suggests he probably “found ample time for his own diversions”, including writing Bellamira (Thomas Killigrew, New York: Benjamin Blom, 1967 , p.94). 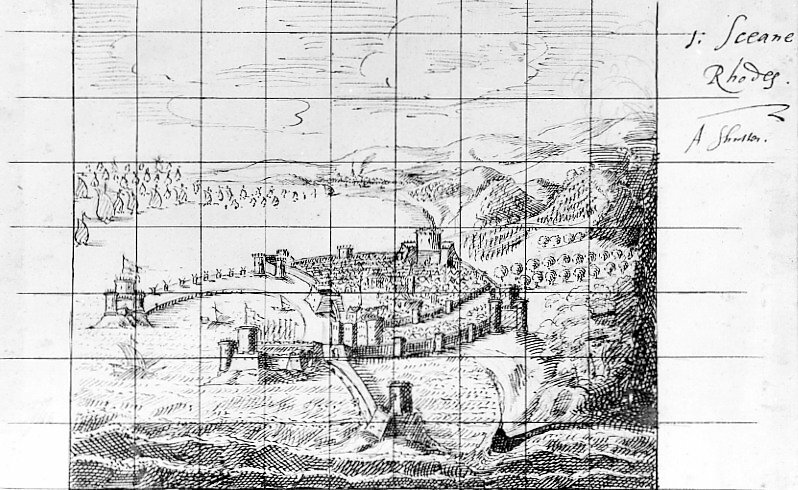 Hedbäck, ‘The Siege of Rhodes: A critical edition’, Studia Anglistica Upsaliensia, 14, Uppsala, 1973, p.56, 80. On the Salmacida plan Webb has marked two dimensions in the relieve area: 3ft 10in from the backshutters to the front of the vertical support for the cloud machine, and 3ft 9in from the rear of this support to the backcloth or board. He has also marked 1ft as the width of the support giving a total of 8ft 7in. This last figure may also be obtained by scaling from Webb’s stated measurements; hence Richard Southern errs when he states this space to be “nearly 7 ft. deep” (Changeable Scenery, London: Faber & Faber, 1952, p.69). 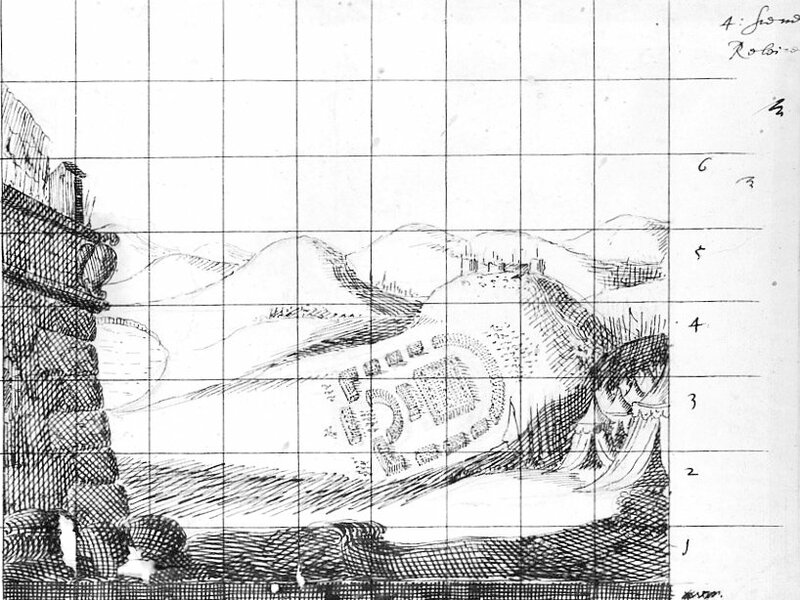 The best reproductions of the Salmacida plan and section are to be found in Stephen Orgel & Roy Strong, Inigo Jones: The Theatre of the Stuart Court, 2 vols., London and Berkeley: Sotheby Parke Bernet and University of California Press, 1973, pp.738-41. See also my analysis of Guzman on this blog and Peter Holland’s discussion in The Ornament of action (Cambridge University Press, 1979, pp.45-6). On October 21, 1661 four months after the opening of Sir William Davenant’s theatre at Lincoln’s Inn Fields (hereafter LIF), Samuel Pepys notes in his diary that the scenic arrangement at the theatre had changed: “To the Opera which is now newly begun to act again, after some alteracion of their scene, which do make it very much worse; but the play ‘Love and Honour’ […] well done”. Pepys’s entry suggests that any model of the LIF stage derived from analysis of post-‘alteration’ LIF plays, my own included, may not be applicable to the first LIF productions. 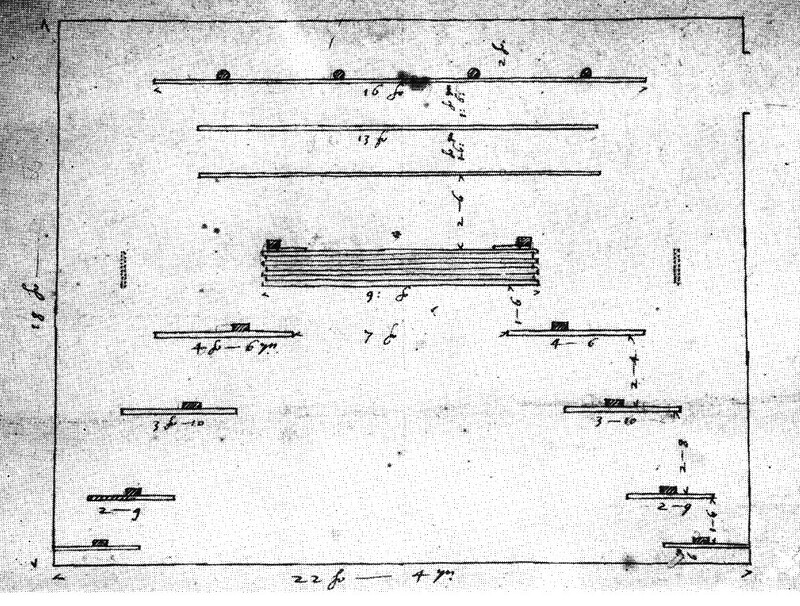 Discussion of this first period of production must, therefore, consider a possible earlier version of the LIF stage arrangement. 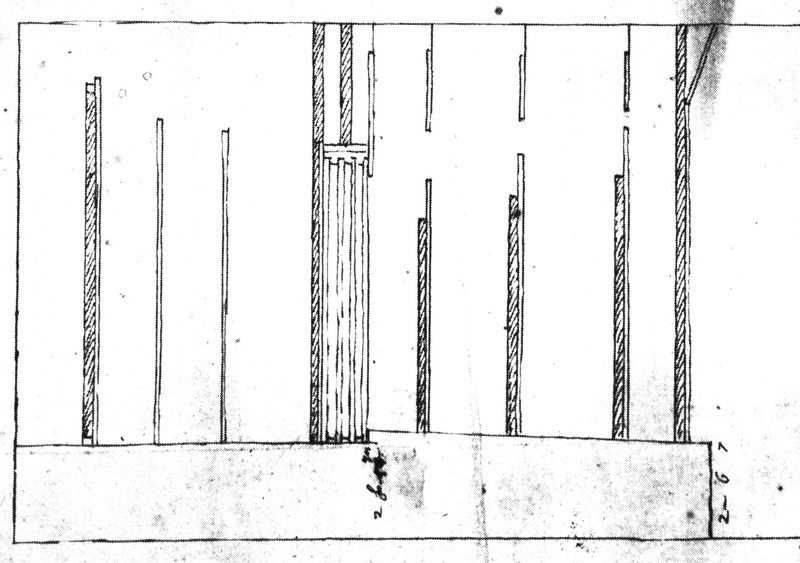 Edward Langhans speculates that the alteration was the addition of additional grooves upstage “for the benefit of deep vistas”. My analysis of LIF plays reveals no clear indication of demand for such vistas; however, Langhans is almost certainly correct in thinking that Davenant made a structural change of some kind to the LIF stage. The exact nature of this change will remain a mystery unless new evidence is found, but I believe it is possible to glean more from the evidence that we do have. The following is, as far as I know, the first attempt to examine this evidence with the aim of inferring the first scenic arrangement at LIF. Langhans makes some interesting speculations about the nature of the changes, but it is possibly more productive to begin by asking why the changes were made at this particular time, rather than suggesting a possible form. It is curious that the alterations arrive when they do. Although records are by no means complete the London Stage has no record of any LIF performances between September 11 and October 21, a gap of 40 days. There was also a hiatus of 35 days after the initial off-season run of The Siege of Rhodes. However, it is easier to view the earlier production as a special case – Rhodes generated much needed cash and put LIF on the map ready for its first season after the summer holiday. The stutter in LIF’s post-alteration production might suggest teething problems at the new theatre, but there is no indication of this in either Pepys’s dairy or in John Downes’s account of Restoration theatre production, Roscius Anglicanus. Admittedly, Downes, who was the prompter at LIF and later with Betterton throughout his career (he retired in 1706), was writing retrospectively, but while his dates may be occasionally faulty, his memory of events at this exciting time in his life is particularly vivid. Pepys has nothing but praise for Rhodes and two out of three other productions that he attended before the alterations. Of Rhodes 1 he says, “the scene opened; which indeed is very fine and magnificent” (July 2); The Wits he pronounces, “a most excellent play, and admirable scenes” (August 15); similarly Hamlet was “done with scenes very well” (August 24); we do not know what he thought of Twelfth Night because he was so conscience-struck for attending that he “took no pleasure at all in it” (September 11). Not only was Davenant’s new venture artistically successful it was evidently making money: Pepys reports that he saw a King’s company production during the initial run of Rhodes and remarked how strange it was to find the Vere Street theatre “that used to be so thronged, now empty since the Opera begun” (July 4). Downes gleefully reports that Rhodes “continu’d Acting 12 days without interruption with great applause”; that The Wits was performed eight days successively; that Hamlet was the company’s most profitable tragedy; and that Twelfth Night “had mighty Success”. None of these reports suggests a theatre with technical problems. The closure and subsequent alterations may, therefore, have been planned. Davenant was a careful and patient manager, he did not rush his actresses into performance before they had been properly trained, and he did not convert Lisle’s tennis court hastily. He first leased the court in March 1660 and by January 1661, deciding, as he put it, “there wanted room for the depth of scenes in the ground belonging to the said Tennis Court”, he leased further ground to build a scene store, which he had already started building by March. If in January 1661 he had a fair idea of how big his scene store should be it seems out of character that he would miscalculate so badly the size of his scenic stage, especially as he seems to have given himself ample time in which to make the conversion. It is beginning to look likely that a closure at some point was planned by Davenant. Lack of cash could well be the reason why he opened with what he did, and excellent box-office receipts the reason why he closed when he did. He might have planned to make the final alterations when he had the cash, and the financial success of his opening productions enabled him to make the necessary alterations at an earlier date. Alternatively, he might have planned the closure date from the start. Either way, Davenant’s financial situation may well have been the determining factor. Cash flow is a problem at the start of any venture, and then as now the building of a theatre is a risky and costly investment. Hotson records Davenant’s underhanded attempt to secure the position (hence, revenues) of Master of the Revels in Ireland, his persistent evasion of the license-fee claims of the English Master, Sir Henry Herbert, and his selling of a number of Duke’s Company shares. All these activities suggest that finances were tight, and in the matter of the shares Nicoll concludes that Davenant’s hand was forced: “Within a few months expenses were accumulating so steadily that in June further shares were disposed of and some more followed the following year”. 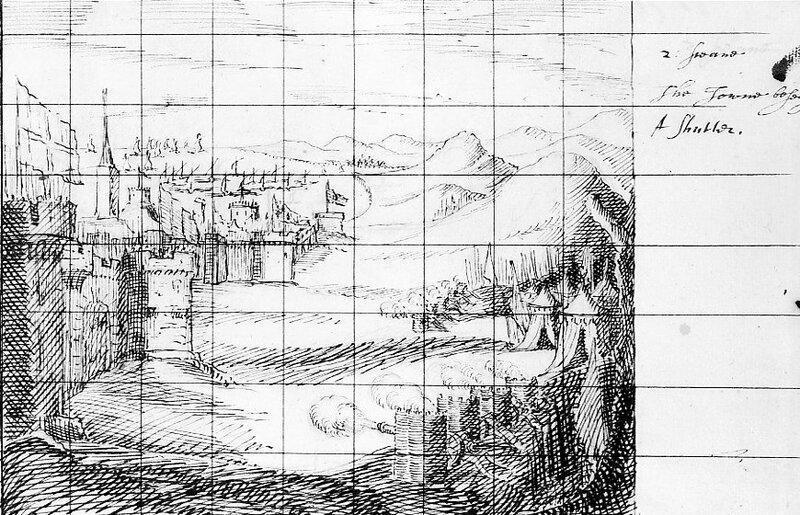 Given this financial situation, and the fact that he already had in store scenery for The Siege of Rhodes and for his Commonwealth ‘operas’ The Cruelty of the Spaniards in Peru and The History of Sir Francis Drake (plus, perhaps, some pre-Civil War items), it would make sense if Davenant had planned to open his new theatre with a production for which he already had scenery, and with old plays that made few scenic demands, while he slowly built up a new scenery stock and improved his cash flow. By opening his new theatre with both parts of The Siege of Rhodes he was not only making a personal artistic statement he was also extracting further use from old scenery, and thereby saving money. Having considered the question of Davenant’s timing, we may now turn to the form of the alterations. There is an obvious observation to make about the idea of using old scenery from Rhodes 1 on the LIF stage – it was designed for a smaller stage, was therefore smaller in dimensions, and made use of only three pairs of fixed wings. This very fact, however, might explain Davenant’s need to alter his scenic arrangement at some point. 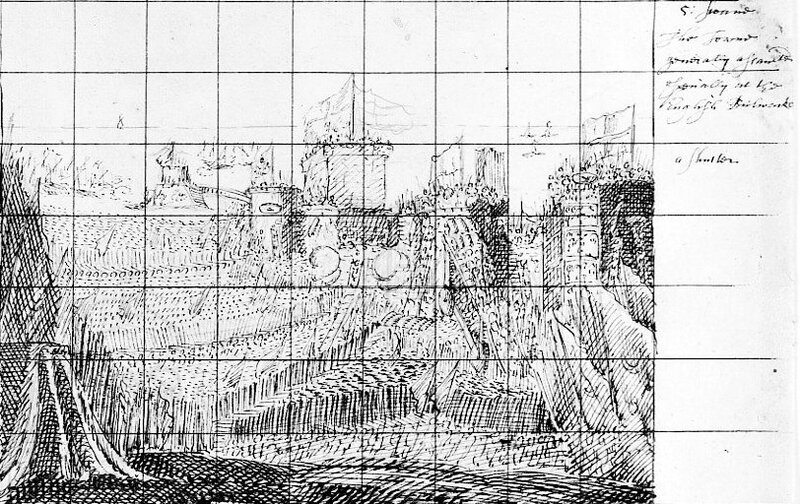 As John Orrell has shown, John Webb’s design for the Rhodes frontispiece records two sets of dimensions (ink and lead) that correspond to the original production at Rutland House and subsequent production at the Cockpit, Drury Lane. The scenic opening is constant in height, about nine feet, but Orrell shows that the width, 18ft 4in in the elevation, was later modified to 16ft 10in. The proscenium opening at LIF was certainly larger, Graham Barlow proposes an opening roughly 25ft square. If the original Rhodes frontispiece was used at LIF, the stage must have been dressed with large amounts of curtain ruches to the top and sides to render it visually acceptable. Acceptable, but not perfect, as the prologue to Rhodes 2 suggests. The prologue apologises for the stage’s “narrow Place” that compared to Continental examples must seem like a mere “Chess-board”. Here, I think Peter Holland is only half right when he states, “None of the editions [of The Siege of Rhodes] in 1663 or later provide any evidence of the staging of The Siege at Lincoln’s Inn Fields”. This may well apply to the play proper, but Davenant’s prologue refers to backstage actresses – “our Women” – quivering with “bashfull fear” of the wits in the audience. As no women would have acted in any pre-Restoration performance of this play it seems likely that the prologue is directly connected to the LIF production. In which case, the prologue’s references to “this narrow Place” make perfect sense. It must have embarrassed Davenant that he was not yet in a position to exploit the available height and width of his new theatre. Far from being ‘unnecessary’ as Holland believes, Davenant’s comments may refer to the temporary stage set up for Rhodes on the larger LIF stage but not to the LIF stage itself. I suggest that the success of the opening productions enabled Davenant to be as good as his word and that once he had made his modifications, LIF scenes were indeed ‘wider’ and moved in necessarily ‘greater’ grooves. Significantly, there are no records of the first part of Rhodes being performed after the alterations, but the London Stage lists several subsequent performances of the second part, the last being at Dorset Garden on March 24, 1677. 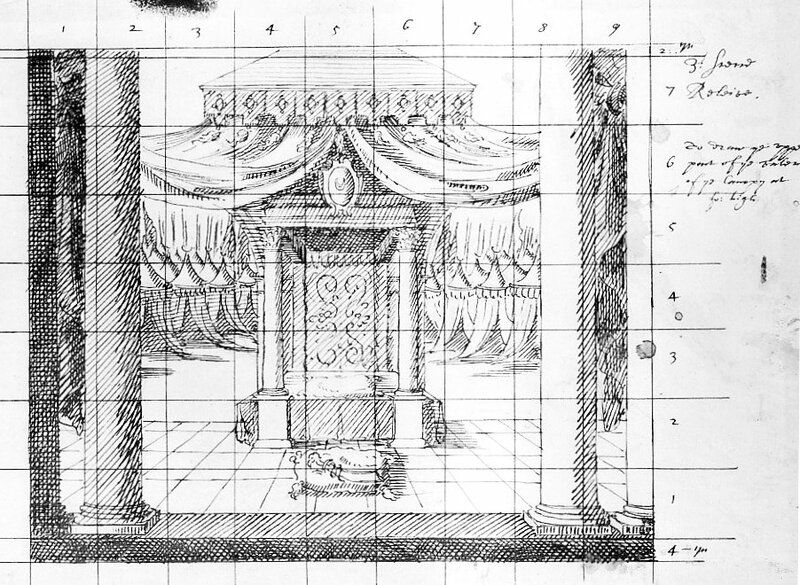 It may not have been technically difficult to accommodate Rhodes 1 on the altered LIF stage, but reverting to the cramped staging necessitated by the old scenery would certainly have looked odd and it may no longer have been considered appropriate for the fashionable venue that LIF had become by the mid-1660s. In contrast, post-alteration revivals of Rhodes 2 may well have been presented with the fuller staging suggested by the text. Whatever changes were made by Davenant to the LIF stage it is important to recall that they did not affect Pepys’s enjoyment of the play and he makes no further mention of it in his diary (even though he attended three performances of Love and Honour in October 1661). In conclusion, if Davenant was short of money after converting Lisle’s tennis court, as seems likely, it would have made sense for him to have opened the new theatre with a tried and tested production and a scenic arrangement that required minimal outlay. However, restaging the Cockpit production of The Siege of Rhodes for both parts of the play (with minor modifications) would not have exploited the full stage space available at LIF. Pairs of single, fixed-wing scenes at three wing positions would have positioned the backcloth around 12 feet closer to the audience in comparison to any likely future arrangement. Therefore, when in September-October, 1661 Davenant subsequently altered his scenic stage to allow the use, if I am correct, of new, custom-built scenery, the backscenes would have been positioned further upstage. A more distant positioning of the backscenes might well explain Pepys’s initial and probably naïve aversion to Davenant’s alterations – the scenery had less initial impact because it was further off. This suggestion has the advantage of fitting the available evidence such that the nature of Davenant’s changes, their timing, and Pepys’s reaction may be seen as related and explicable. Langhans, ‘Staging Practices in the Restoration Theatre 1660-1682’, unpublished PhD thesis, Yale (1955 ) p.289. Keenan, ‘Early Restoration staging: play production at Lincoln’s Inn Fields, 1661-1674’, unpublished PhD thesis, London (2006). 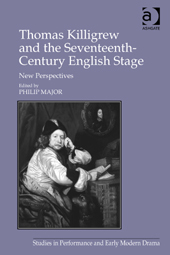 The London Stage notes that the theatrical season remained fairly constant during the 40 years from 1660-1700: the “schedule prevailed from October to June, with less frequent acting from June through September” (op cit introduction lxvii). As well as being the Duke’s Company’s prompter, Downes made his acting debut at the premiere of The Siege of Rhodes. Unfortunately, the presence of the King and his nobles had a debilitating effect: “the sight of that August presence, spoil’d me for an actor” (Roscius Anglicanus, op cit p.34). Although both parts of Rhodes were initially performed at LIF, most of Pepys’s references to Rhodes are to part two. Op cit pp.21-3. There is no evidence to show how scenery was allocated to these old plays, but it was likely to have been minimal judging by a promptbook for a later LIF revival, Shirley’s The Witty Faire One, which was allocated only three settings (see Langhans, Restoration Promptbooks, op cit p.43). See Hotson, Commonwealth and Restoration Stage, op cit pp.124-5. John Freehafer refers to the possibility of pre-Restoration scenery in his ‘Perspective Scenery And The Caroline Playhouses’ (Theatre Notebook, 1973, vol.27, no.3, p.111), though it is doubtful that any such scenery could have been used at LIF without modification. See Theatres, op cit pp.68-74. Ibid. The height of the frontispiece is 11ft but this includes a 2ft architrave. Surprisingly the narrower opening was required to fit the otherwise larger Cockpit space. See Thesis, op cit vol.3, Fig. 16. Holland, Ornament of action, op cit p.257, n.65. Danchin, Prologues 1.1, op cit p.67. Webb shows 18ft but this includes approximately 2ft behind the backcloth. The London Stage editors list a performance of the first part in May 1667, their evidence being a Lord Chamberlain’s list of royal performances for this period (reproduced by Nicoll, History, op cit p.346), but the LC entry records only the play title not the part and is therefore inconclusive. Further alterations to the scenery must have been made for the DorsetGarden revivals. The London Stage calendar records no performance at LIF from September 11 to October 21, though records are by no means complete. If this is anywhere near accurate, the theatre was closed for at least a month. Judging by the Warrants for carpentry work at Court theatres (See Boswell, Restoration Court Stage, op cit p.236) this would have been more than enough time for some major restructuring, if required.